I suddenly found myself with too many PTO days that I had to use or lose. I decided to use a week off and visit friends and family on the East Coast. The entire trip was put together haphazardly last Friday evening. I came up with a route that will cover 3 cities: Washington DC, New York and Atlanta. I called the Continental Elite helpdesk, and was assisted (very professionally) in putting the route together. I left last Sunday morning, at 6:30am, heading towards Minneapolis, MN. The temperature was 10F (-12C) and the whole airport was covered in snow. I managed to take a few pictures of some snow-covered Air National Guard C-130s, and was luckily on my way to DC within the hour. It’s been years since I visited the nation’s capital. I was picked up by my good friend Gil and his wife, and we went out for a dinner in Shirlington, one of DC’s “hip” suburbs. The next day we went to see the new arm of the National Air and Space museum. 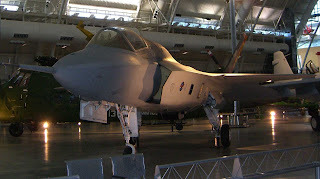 Hosted in a hangar close to Dulles airport, it hosts all the “big” airplanes from the collection. I was impressed with the X35 – the most recent addition – that served as a prototype to the F35, the most advanced jet fighter in the world (yes, I was an airplane geek before becoming a computer geek ). I also liked seeing the Blackbird again. I also got a chill in my spine when I saw a Kamikaze “airplane” (they were essentially man-guided missiles) and remembered that suicide bombing started long ago. 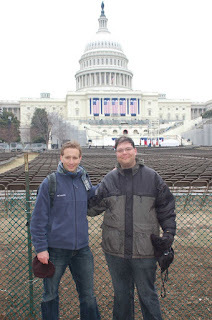 The following day, despite freezing temperatures (30F or –1C) we went to the Mall (not to be confused with “a mall” ). 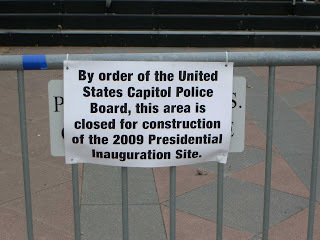 We started by visiting the Capitol, where preparations for Barack Obama’s inauguration were in full swing. We visited the National Archive, where we saw the 3 most important documents in American history: the Declaration of Independence, the Constitution and the ill of Rights. There was also a copy of the Magna Carta on display – the second I saw in my life (the first I saw was in the Salisbury cathedral in England, en route to Stonehenge. The cathedral has 4 copies. Here's a link to photos from that trip). But what I found most interesting was a display of pre-independence documents, contributed by the Canadian government, describing the life in the colonies and the negotiations that led to the war and the cease fire achieved at its end. Here's a link to some more photos from the Mall. Plane – costs $130-200, flight takes an hour. Takes another 2 hours to do the airport shuffle on the DC side, and another hour to take a taxi to Manhattan on the NY side. Train – costs $130 on rush hour, $72 after 10am. Takes 3-3:30 hours (depending on the number of stops) and deposits you in Penn station in Manhattan. Bus – costs $22 (or $15 if you take one of the Chinese companies – although you end up in the Chinatown part of NY). Takes 4-5 hours (depending on traffic). Not really comfortable. You end up at Port Authority, right by Times Square. 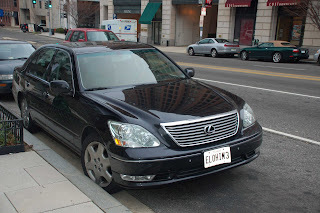 Car rental – costs $45-100 (depending on the company). Takes 3-5 hours (traffic) and requires your full attention. I had time to kill so I chose the bus. Traffic was light and the driver took only toll roads. I had 2 seats, and was actually able to do some work on my laptop (using a wireless card). We ended up in NY after 3:30 hours. I walked briskly to my hotel (it was 30F and getting worse). In the evening I met a good friend for a Thai dinner (Bangkok Cuisine on 46th between 8th and 9th – great service, good enough food). He commented that I chose the worst week of the year to travel to NY. The day after, when it started snowing, I had to agree. I’m a tropical kind of guy. I seriously missed California while rushing through the snowy street. I met my cousin and traveled to Brooklyn to meet my sister. I really like New York City. It’s the city I visit most in the US and I can see myself leaving there – for 8 months of a year. I can not be there during winter. From New York, I continued to Atlanta, to visit my best friend Yaniv, who’s currently finishing his MBA (here’s a link to one of his blogs) and his lovely wife. And what do you know? Atlanta was frozen too (32F – 0C). Still, it did not stop us from having a wonderful weekend and some great Ziti. Yesterday, I flew back to SJC and landed back in paradise (77F – 25C) - I love California! To quote a famous Hebrew song: It's great to roam, but greater to return. And I still have enough PTO days to start planning my next trip. Stay tuned.